I met a guy in the library this morning who is a regular guest of the Bridge St. United Church meal ministries. Before he found work again he gave as well as received, helping in the kitchen almost daily. He became a member of the congregation eventually, and we were able to provide solace and support when he went through the loss of a loved one. Last evening was the first of 42 consecutive evenings of hot, sit-down meals at the church called Inn from the Cold, a ministry which has existed for years and involves more than 150 volunteers. He told me he sat with friends and he would probably be there again today. I'm quite content with retirement but I do miss this aspect of my ministry at Bridge St. Ruth and I came to know a number of the regular guests. We sat with them and listened to their stories and laughed with them. Oh yes, we ate with them. I also miss the eclectic cadre of volunteers. While a fair number are from the congregation, at least two-thirds are from the wider community -- other congregations as well as those who see service to others as an essential part of a meaningful life. The teams of meal preparers eat together at midday after fulfilling their tasks and I enjoyed getting to know them. Their commitment through snowstorms and tough life circumstances is remarkable. One woman who hands out frozen meals for Thank God Its Friday (another meal distribution) was back on the job ten days after her husband's death. She wanted to provide continuity to the recipients and she felt it would help her through the grief. Most of us realize that meal programs and food banks are not solutions to the systemic realities of poverty. 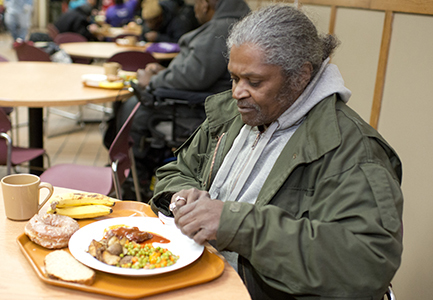 But as one involved person opined, it would be wonderful if it was no longer necessary for our guests to attend the meals for physical sustenance, yet still came for the opportunities for community and mutual care. God be with all those who find their way to Bridge St5. for sustenance and nourishment for body and spirit. God be with those who've chosen this important form of service. Whatever their reasons for contributing, these are ministries in Christ's name. Kudos to everyone who gives of him/herself by volunteering time for a cause. It is so easy to just focus on work and your own life that it's easy to just put volunteering to the side. I work long hours these days, including a three hour daily commute, however I do plan on making volunteer work a significant part of my daily life in retirement. I'm not yet putting an "x" each day on the calendar....but it's getting closer! I like the idea of meals just for fellowship. I realize IFTC is a necessary godsend now for those less fortunate than I, but it might be a good idea to have regular congregational meals. It would be good to sit and talk with folk with whom you never haver have a regular conversation, and who have some interesting stories to share.